The best option is to choose creams or sprays for babies, because these are specially formulated for young skin and are safe to use from six months of age. Use a sunscreen with an SPF (Sun Protection Factor) of at least 15 against UVB rays. Make sure you buy a broad-spectrum brand that offers both UVA and UVB protection. High UVA protection is shown on the packaging. Apply sunscreen liberally to any area of your baby’s skin that isn’t covered up by clothes or a hat. Remember to include his hands and feet, and the back of his neck and ears. It’s best to pat it on rather than rub it in. If you can, put sunscreen on your baby 15 minutes before he goes outdoors. Reapply the sunscreen at least every couple of hours and after he has played in water, even if the sunscreen is waterproof. Some water-resistant products may only protect your baby’s skin for up to 40 minutes of water play, while others may protect for up to 80 minutes. Some brands make tinted sun creams, so you can see if you have missed a bit. Try to find a sunscreen product that you find quick and easy to use. That way, you’ll be more likely to use it. Make sure you use up your sunscreen before the expiry date, or within the time recommended on the label, once the sunscreen has been opened. The active ingredients may not work so well after a while. If your baby has eczema or particularly sensitive skin, check the ingredients list for anything you know is likely to cause irritation or an allergic reaction. Testing the sun cream on a small area of his skin first could be a good option. Here are some information about the Babyganics family, their background story and, most important, their mission. After you have read this, we promise, your and your baby’s life will be so much better. Kevin and Keith are childhood buddies who grew up together. The two of them have been working on their dreams for their whole life. One of those numerous dreams was launching a company that would be dedicated to the incoming generations. So Kevin and Keith put their talents and skills together to bring Babyganics to life. And the main mission of the Babyganics family is to raise the next generation of healthy, happy babies. Since the members of their team are caring parents themselves, they joined their forces with the best scientists, dermatologists, pediatricians and others, and dedicated their entire time to create products that will be perfect for your babies. 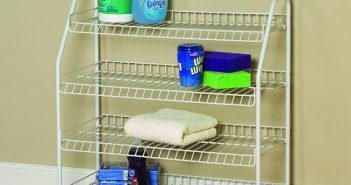 All kinds of products that would help them make their entire home a super safe place for your baby to do what babies do: explore freely—without having to worry. And more important, without you having to worry about anything. Babyganics company has a variety of products made with love for your babies. From high quality organic diapers, laundry detergents, all types of wipes, hand sanitizers, to perfectly gentle bath and skin care essentials such as: bubble baths, shampoos, teething pods, balms and- sunscreens made especially for protection of the sensitive baby`s skin. This sunscreen lotion is perfect for complete UVA + UVB protection of your baby`s skin. It has SPF 50. It is also water resistant (the protection lasts for 80 minutes) so your child can spend plenty of time playing in the water. It is made completely of high quality, natural ingredients: It consists of exclusive 100% natural NeoNourish Seed Oil Blend to help nurture and support sensitive baby’s skin. A special non-allergenic formula is naturally gentle on skin and tear free and it is tested and approved by pediatricians and dermatologists. It includes no: PABA, phthalates, parabens, fragrances or nano-particles it is never tested on animals. It`s mineral- based SPF formulas provides broad spectrum UVA/UVB protection and glides on smooth for effortless application. The tube contains 6oz of the product. In this package you get 2 tubes. Instructions for application: Apply liberally and evenly 15 minutes before sun exposure. Reapply after 80 minutes of swimming or sweating, immediately after towel drying and at least every 2 hours. This product is meant for targeted protection and small areas of exposed skin. For full protection, use in conjunction of another sunscreen lotion or spray. Children under 6 months of age: ask a doctor. 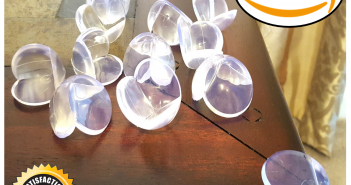 Pros: High quality, natural ingredients, does not contain harmful chemicals, perfect for sensitive baby`s skin, no rashes or allergies, no bad odors, smooth and light feeling on the skin, not sticky, good coverage. Cons: It leaves heavy white residue on the skin, a bit difficult to rub in the skin, too thick, not the greatest for dry skin, some buyers complained that this product is not completely organic. Check out the Babyganics Mineral-Based Baby Sunscreen Lotion here. 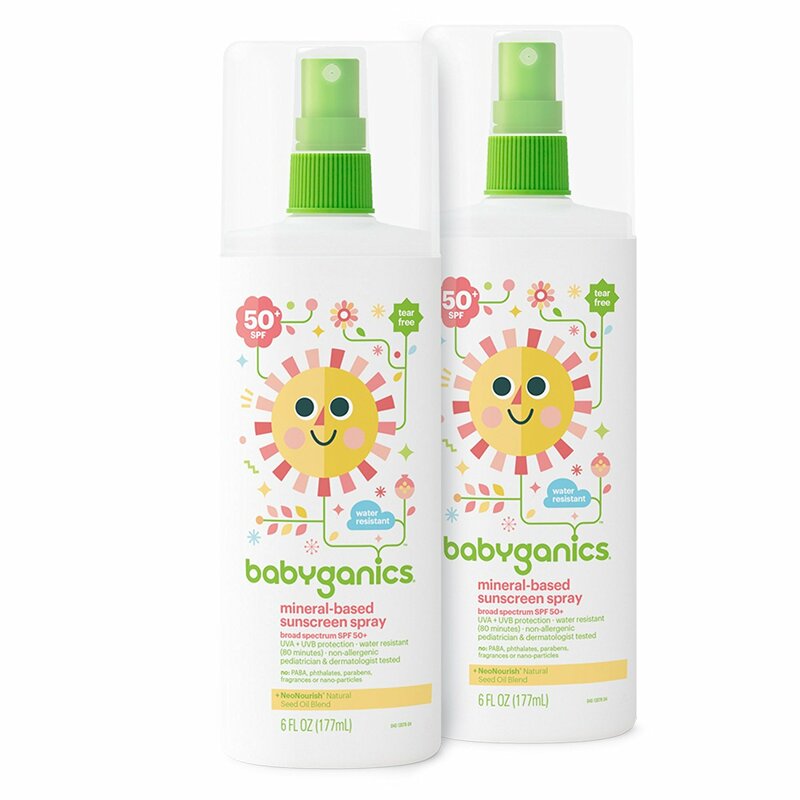 Babyganics baby sunscreen spray with mineral-based formula can promise you total UVA + UVB protection for your baby. It is also water resistant (your baby is free to play in the water for 80 minutes). It has SPF 50 protection and this is an optimum SPF for the protection of the sensitive baby`s skin. 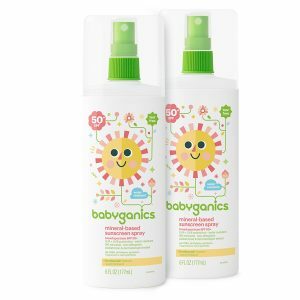 Babyganics baby sunscreen spray is made completely of high quality, natural ingredients: It consists of exclusive 100% natural NeoNourish Seed Oil Blend- this ingredient will help nurture and support sensitive baby’s skin. A special non-allergenic formula is naturally gentle on baby`s skin and it is tested and approved by pediatricians and dermatologists. It includes no: PABA, phthalates, parabens, fragrances or nano-particles it is never tested on animals. It`s mineral- based SPF formulas provides broad spectrum UVA/UVB protection and glides on smooth for effortless application. This package includes two spray bottles of 6oz. Pros: Easy to apply, natural and safe ingredients, great for sensitive and eczema prone skin, silky and smooth feeling on the skin, waterproof, approved by doctors, affordable price. Cons: Creamy texture, leaves heavy white residue on the skin, strong smell, not the best pump. Check out the Babyganics Mineral-Based Baby Sunscreen Spray here. If you want to learn more about Babyganics as a company, check out our Babyganics Diapers Review post here. 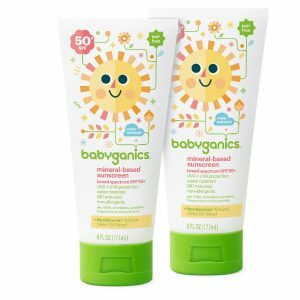 Hopefully these two Babyganics sunscreen reviews of the the Babyganics Mineral-Based Baby Sunscreen Spray and the Babyganics Mineral-Based Baby Sunscreen Lotion help you as you bring up your baby in the healthiest way.